If you move especially large, heavy or bulky items around your manufacturing plant (think industrial pipe, dies, metal coils, heavy equipment, structural steel, assemblies), you know how difficult it can be to move them safely and efficiently. As one company discovered, there’s always room for improvement. Until recently, a manufacturer of stainless steel pipe for the oil and gas industry had used a side-loading forklift to transfer 20- to 40-ft.-long steel pipe from a cart to a work cell in its facility. The forklift presented a safety issue: the operator needed to turn 90 degrees to face the line of movement during transport. The forklift also occupied a relatively large footprint, with minimal maneuverability within aisles. This limited the speed and efficiency of the transfer process, chipping away at productivity. 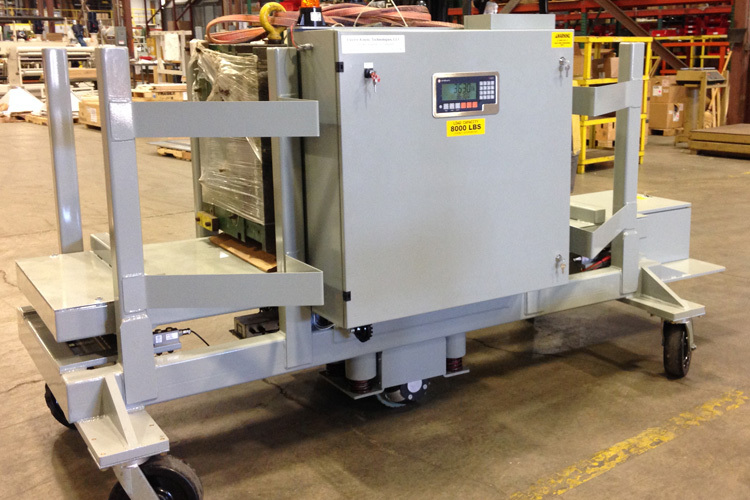 Electro Kinetic Technologies worked with the customer to design and produce a transfer cart with radio frequency control. This eliminated the need for a forklift, as well as the need for an operator to obtain forklift training or touch the cart. The transfer cart is also highly maneuverable, with a powerful dual independent drive system, a turning radius of half the cart length, and variable speed control. An on-board scale helps prevent overloading of the cart and improves safety and functionality that had been problematic in the past. This cart has a payload capacity of 8,000 lbs. up a 5-degree incline. Advanced-technology transfer carts offer advantages to help you improve workflow, safety and productivity. Flat decks or fixtures customized for specific loads up to 40,000 lbs. Custom deck configurations including built-in scales and lift/tilt/rotate capabilities. Track or trackless, non-guided steering. Alternative drive and steering systems including gear reducer axle drives and individually-controlled drive wheels. Fixed or variable speeds with forward/reverse function. Variety of operator control systems including fixed user interface, pendant control on coil cord, and radio-controlled remote operation. On-board battery charging for DC-powered drives. Safety features including horns, flashing lights, e-stops, bumpers and collision avoidance systems.